Innovation in business mobility is adding up to opportunity for the enterprise— opportunity to accelerate employee productivity, increase collaboration, and streamline business processes through mobile applications. At the same time, IT organizations are keen to control costs and maintain safeguards around their corporate information. With the goal of striking a balance between opportunity and control, increasing numbers of IT decision makers are adopting enterprise mobility management (EMM) solutions. But how do you know your organization is poised to make the move to EMM, or if you should be leveraging more from an existing EMM solution? 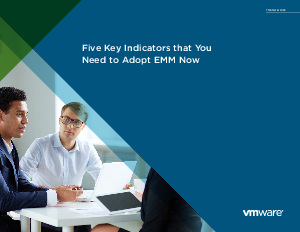 Here are five cues to consider that the time is right to adopt EMM for your organization.